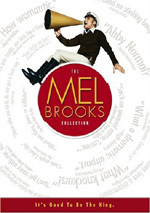 Wilder borrows from the master Mel Brooks' book in this comedy about Sherlock's less-well-known brother who takes his famous relative's case overflow. Great mid-70s comedy ensemble. 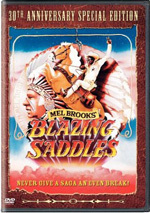 When Gene Wilder didn’t make movies with Mel Brooks, he worked in flicks that seemed like they were created by Brooks. Audiences could easily be mistaken and think that Brooks was behind efforts like 1979’s The Frisco Kid and 1975’s The Adventure of Sherlock Holmes’ Smarter Brother. I didn’t care much for Frisco, but I hoped to take more pleasure from Brother. The flick introduces us to Sherlock’s younger brother Sigerson (Wilder). He jealously lives in his more famous sibling’s shadow and thinks he deserves more credit as a sleuth than he receives. At the film’s start, Queen Victoria (Susan Field) gives a secret document to Lord Redcliff (John Le Mesurier). This soon goes missing, a fact that seems to potentially endanger the safety of the British Empire. The case ends up in Sigerson’s hands when Sherlock sends Sgt. Orbille Sacker (Marty Feldman) to involve him. From there Sigerson meets Jenny Hill (Madeline Kahn). An inveterate liar, Sigerson has to gain her trust to learn the facts of the matter. The film follows Sigerson’s attempts to solve the mystery and all the complications that come along the way. Narratively, Brother is a mess. For the synopsis, I tried to make sense of the story, but don’t take that to mean that the film itself will seem as clear. In reality, the plot acts as little more than a framework around which Wilder stages a lot of comedy bits. For the most part, that works fine, though I feel the film would have fared better with a more coherent plot. I don’t particularly mind flicks that favor gags over story, but these succeed best when they feature inconsequential plots. Take something like Caddyshack, for example. It’s also a mess in the narrative sense, but since its story really doesn’t matter, this doesn’t do much to negatively impact the movie’s overall prospects. That’s not the case for the much more story-oriented Brother, though. Within its first few minutes, its convoluted tale threatens to lose us, and matters don’t much improve as it progresses. There’s a thread of a tale buried somewhere in the mess, but I’ll be damned if I could make much sense of it. At least the film includes enough fun moments to make it generally enjoyable. To be sure, an excellent cast bolsters matters. Brother packs a mix of Brooks veterans. I already mentioned Wilder’s history with Brooks, and actors Kahn, Feldman and Dom DeLuise popped up in a variety of Mel’s flicks. They add life to this project and help keep its meandering tendencies from becoming too much of a burden. The film works best when Wilder, Kahn and Feldman appear onscreen together. This doesn’t happen often, but the flick really flies during those moments. They exhibit a wonderful chemistry that helps add life to the proceedings. Brother enjoys more than a few other quality comedic sequences, though it rarely becomes particularly scintillating. The flick ties together just enough humor and amusement to make it worth a look. This isn’t high quality entertainment, but it acts as a passable diversion. Beatles fans take note: Brother reunites Help! veterans Leo McKern and Roy Kinnear. 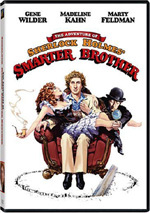 The Adventure of Sherlock Holmes’ Smarter Brother appears in both an aspect ratio of approximately 1.85:1 and in a fullscreen version on this double-sided, single-layered DVD; the widescreen image has been enhanced for 16X9 televisions. Only the letterboxed picture was reviewed for this article. It offered a truly erratic transfer. Sharpness varied a lot. Much of the movie showed reasonably crisp and concise elements. However, the flick also could look rather soft and fuzzy at times. I didn’t have great concerns with the image’s accuracy, but I’d have liked more consistency from the sharpness. Jagged edges weren’t a concern, but I noticed a little shimmering, and some mild edge enhancement also popped up through the movie. Source flaws were a moderate concern. Brother looked awfully grainy at times, and I noticed a mix of other problems. The transfer showed more than a few specks, marks and other defects. They weren’t rampant, but they created some distractions. More issues came from the colors. The movie portrayed a natural palette that occasionally demonstrated good vivacity. However, even some of the bolder tones sometimes looked flat. The movie displayed a moderately murky tint that could make colors look less vibrant than I’d expect. Blacks were reasonably deep and firm, but shadows were mediocre. The low-light shots tended to seem a bit too dark. There was enough positive material here to make this a “C+” transfer, but it lacked the consistency for a higher grade. Similar feelings greeted the Dolby Stereo 2.0 soundtrack of The Adventure of Sherlock Holmes’ Smarter Brother. To refer to this as a stereo mix was something of a joke. The audio broadened only slightly to the side speakers. This was really a case of “wide mono” in which material – mostly music – opened up just a wee bit. There wasn’t much to distinguish the stereo soundfield from the monaural one. Audio quality was acceptable but unspectacular. Speech showed a little tinniness but remained acceptably distinctive and lacked problems with intelligibility. Music failed to demonstrate much life. The score was concise and without flaws, but it didn’t show great range. Effects fell into the same category. Those elements sounded fairly clean and weren’t distorted, but they never stood out as bright or rich. This was a listenable mix with no particular strengths. 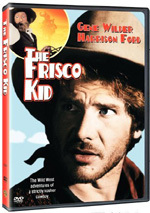 The DVD’s main supplement offers an audio commentary with writer/actor/director Gene Wilder. He presents a running, screen-specific chat. Since he serves so many roles on Brother, I expected him to have a lot to say. Unfortunately, he makes this track only occasionally interesting. Wilder lets us know why he took the gig as director, the cast and aspects of their performances, sets and locations, storytelling and editing choices, and a few bits of trivia. Much of the time he remains silent, and when Wilder talks, he rarely tells us any useful information. He offers a lot of general narration and fails to make this a worthwhile commentary. Frankly, it’s a snoozer. We also find a collection of trailers. The disc features ads for Smarter Brother along with promos for Silver Streak, Young Frankenstein and World’s Greatest Lover. As a comedy, The Adventure of Sherlock Holmes’ Smarter Brother seems slightly above average. Though the movie never quite takes flight and suffers from a convoluted plot, it offers a strong cast and just enough funny material to maintain the viewer’s interest. The DVD features fairly average picture and audio along with extras headlined by a very disappointing audio commentary. The disc’s low list price makes it worth a look, but I can’t heartily endorse this erratic movie and DVD.